Unocoin.com – How good are their services? 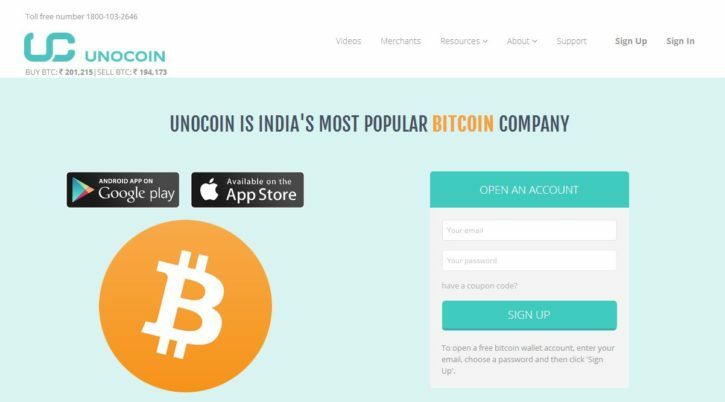 Unocoin.com “India’s most popular Bitcoin Company” -How popular are they and how good is their service? A quick search on Google and I read about “Poor infrastructure, located in a crowded location. The office does not look like a corporate. It is somewhat like small booking agency for a bus ticket.” -Binod Thakur, a customer that posted in Google reviews. Are they really that bad? Well, let’s look into that for you. Let us start with the company structure itself. They company is registered under Unocoin Technologies Private Limited and is located in Bangalore, India. They have been around since 2013 and is India’s first company to venture into the Bitcoin world. The CEO is Sathvik Vishwanath, he has fifteen years of experience under his belt in building software systems for the financial industry. He also holds an MBA for IT and Business from the University of Melbourne. 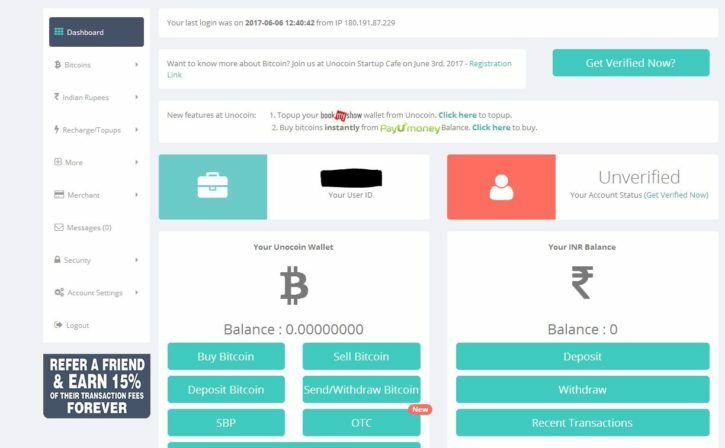 The website acts as a Bitcoin exchange and wallet at the same time. This means that you are able to buy/sell and store Bitcoin with them. Please be advised that verification with this website would require you to have a PAN card. This is to comply with KYC/AML policy to protect users from illegal activities. If you do have a PAN card, then let’s proceed. You will then be redirected to your account/profile page. Click on the Dashboard tab which is located on the left-hand side of the page. This would then bring you to the dashboard where you can start the verification process by clicking on the “Get Verified Now?” button on the upper right-hand corner of the screen. You will then be given a form to fill-up. On this form, you would need to have a scanned copy of your PAN card uploaded into their system along with a valid proof of address with a photograph. After you have submitted, your account status will then be at the “Verification Pending” stage. The final stage of the verification process will be done over the phone, so keep your lines open. Sadly there is no expected time-frame on when your account would be verified. What do you get for a verified account? For starters, you are not able to use their services if you are not verified. This means that you would not be able to buy/sell or use their wallet services. For example: If you want to buy bitcoin worth INR 10,000.00 then you would be paying INR 10,115.00 in total. 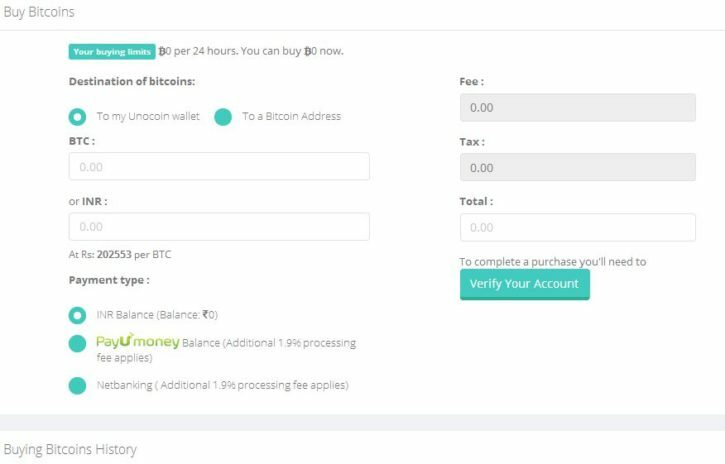 This is because you need to pay the 1% transaction charge to buy Bitcoin which is INR 100.00 plus the government tax on that transaction fee INR 15.00. They also provided their Service Tax number which is AABCU8112DSD001. You can search the database for the registered tax number through this website. People that plan to buy from unocoin.com and choose to receive it on a separate wallet, would not be charged as this is free. When sending Bitcoins to a different Bitcoin address, you would be charged BTC 0.0005. As of this moment, the only currencies they accept would be INR (Indian Rupees) and Bitcoin. For extra Bitcoins, a registered user of Unocoin.com can refer their friends and get 15% of the transaction fee made by those successful referrals. You get the referral bonus in the form of Bitcoin credited directly into your wallet. Fees can also be checked here. The website shows the experience of the people behind Unocoin.com. You would have everything that a person would need to know about their company before having to register with them, I’m impressed. Under the Resources tab, you can find everything from FAQ’s, Security, Charts, News, Unocoin Merchants and much more! It is fairly easy to navigate and at the lower part of the website, you would also have a calculator for buying/selling Bitcoin with Unocoin.com. 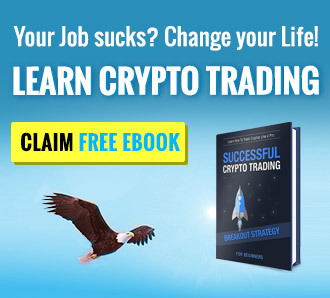 You would get an idea of how much they are selling their Bitcoins for without registering with them. The 2-Factor authentication is provided but not required upon registration. You can simply add this feature to your account when you have registered with them. On the left-hand side of your homepage, click the “Security” tab and choose which one you want to add or edit. There are no claims on their servers being hacked before as most of the hacking problems where more on the customer’s negligence of security. On the earlier stage of the website, might it be a few years ago they would have been working fine. But fast forward to 2017 and a couple of issues in the past, they have one of the worst Customer Service in the market. Why? Simply because of the volume of people that come to their website on a daily basis. They conduct manual checks on the PAN cards and not to mention answer tickets through an email system. There is something that I find interesting about them though. Despite the fairly negative reviews all around, they are one of the few companies out there today that give back to the community. 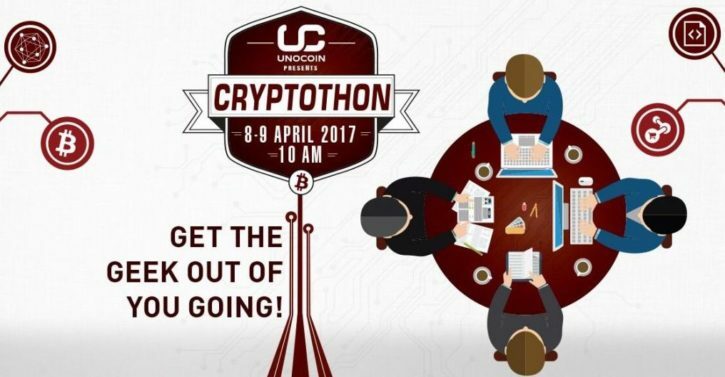 Like the recently held Cryptothon last April 8-9, 2017 at 91springboard, Koramangala, Bangalore. Prizes would go up to INR 50,000.00 worth of Bitcoins. As of today, that would be around BTC 0.25141294 if you purchase it directly from them. All-in-all the general review of the website is decent. If you are located in India and planning to use their services, it would be best to conduct business with them lightly. There might be a twist of reviews due to the referral program they are giving out. But they have transparency and community involvement, which is something.